High Yield Investment Programs are a special kind of investment service which should rather be described as gambling systems. 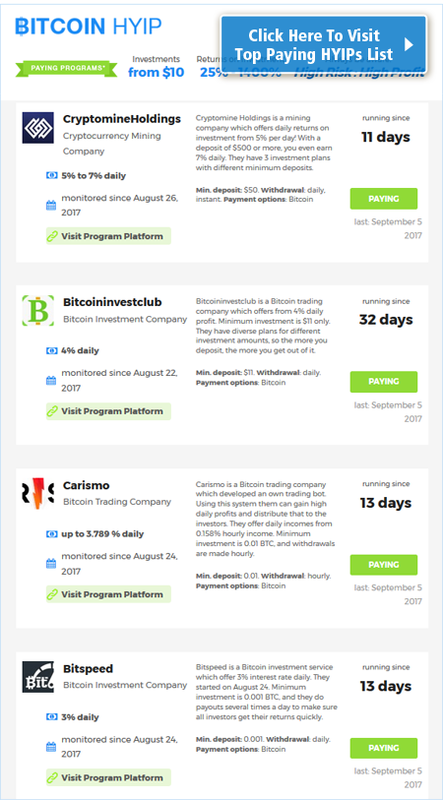 Those programs are just called “investment” as the only thing you actively do in this game is making a deposit and claiming your payouts by daily clicking a withdrawal button. Sometimes they have auto-withdrawal function, so you even don’t have to do the latter by yourself. You’ll find many posts in the internet where people are angry and complain about those Bitcoin HYIP scams because they ran away with their money. But honestly, those guys simply hadn’t understood in advance what high yield investment programs are. They are simply a game – yes, a ponzi scheme, a scam, you can call them as you want – but they are basically games which run for an individual unknown lifetime. This runtime depends on how many people jump on the train, meaning how many people make new deposits every day. As it’s kind of a game, you simply have chances to win or lose – as you have when playing other games – let’s say a slot machine, lottery, craps or bingo. Maybe chances to get profits out of a HYIP for Bitcoin are even way higher, as you have to know how to play this game. Because you can actively maximize your chances to really gain the high profits if you know how to. This means you have to know when it’s time to make a deposit and when it’s rather too late and you should stay away from the program. Of course, even then you don’t have a guarantee that you get your principal back with the high profits on top, but at least chances are way higher than in a lottery to get something out of it. And that’s why many people are playing this investment game. Actually there are even many programs which run for several months. In those cases there must be really a lot of early investors who have got their high yields for sure. Let’s say the program ran for 6 months, then all people who started within the first 3 months should have got their profits out of it. So the trick is just to be early in the game, then you get the high gains. And you have to hope that the system runs for a while and doesn’t collapse at the very beginning already, what sometimes happens. As said, usually in this field we are talking about Ponzi Schemes. This means that each return on investment is payed by the people who are depositing Bitcoin afterwards. So you make a deposit and the ROI you get is payed by the guy who’s making a deposit after you. And that guy’s RIO is again payed with the deposit a guy makes after him. And so on.. So the calculation only works as long as there are enough new deposits beeing made to be able to payout the earlier investors’ profits. That’s the way how the system can stay an actually paying Bitcoin HYIP. From the point where there is a lack of new investors, the system falls apart. Then it can’t payout the returns anymore and it won’t even pay back any principals as this is the point where the website owner takes the Bitcoins which are left and runs away. Meaning the website will be offline within a couple of days after that point and you’ll never hear something from them again. But if you are an experienced and passionate high yield investment program player with your Bitcoins, then you of course know about all this stuff and just enjoy hunting the brand new paying programs to try your luck! Our list shows the current paying HYIPs accepting Bitcoin.